Gator is more beginner-friendly than the regular RumbleRollers, but don’t mistake it for a beginner’s roller. The advanced features of this roller benefit even the most experienced athlete. The first thing to note about the Gator is that its firm surface and small diameter (about 4.5″ or 115mm) produce high compressive forces in the muscle. You’ll get as much localized compression as with PVC pipe, but with much less pain or soft tissue damage. You’ll also find that the smaller diameter allows you to better work smaller body depressions, such as the arch of your foot or the curve in your neck. Pressing harder and deeper isn’t the only way to massage a muscle. Another way to free stuck tissues is to pull them apart. Of course you can’t grab the deeper tissue directly, but you can move higher layers of soft tissue to create a separating (shear) force that displaces underlying layers. This approach is often referred to as cross frictional massage. Cross frictional massage is normally done by a massage therapist who uses his thumbs or fingertips to apply short, firm strokes across the muscle fibers. RumbleRoller’s Gator is the only foam roller that can grip your skin well enough to mimic this type of massage. If you look closely at Gator’s surface, you’ll see hundreds of tooth-like bumps with slightly concave ends, flat sides, and prominent edges. The bumps are very resilient, but have high lateral stiffness and generous skin-holding spaces between them. This patent pending surface grips bare or lightly clothed skin, and resists slippage in all directions. Cross frictional massage doesn’t automatically happen just by rolling on the Gator. To employ it, you have to learn a new (but very simple) technique. Position yourself as you would for any rolling exercise, with your body on top of the Gator or otherwise pressed firmly against it. But instead of rolling, make an effort to shift your body an inch or so toward one end of the roller. During this time, the bumps should remain engaged with your skin, and you’ll feel a tugging force on the underlying muscle. Repeat and reposition as needed. Try adding this technique whenever a muscle isn’t responding to conventional rolling movements. RumbleRoller’s Gator is only produced in our popular 22″ (554mm) length. 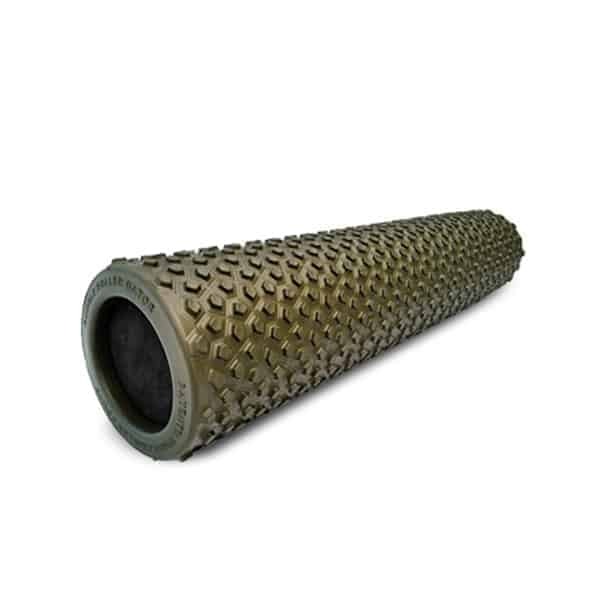 The firmness (similar to that of our X-firm deep-tissue roller) is perfect for both rolling and cross frictional massage.